Whereas many propelled toys of this era relied on clockwork motors, the Jet-Car uses a compressed spring to propel it across the floor. Some kind of probe would be inserted up the jet nozzle, compressing a spring that resides inside the body of the car. To release the car, you simply press down on the rear fin and the car zooms away from the probe. 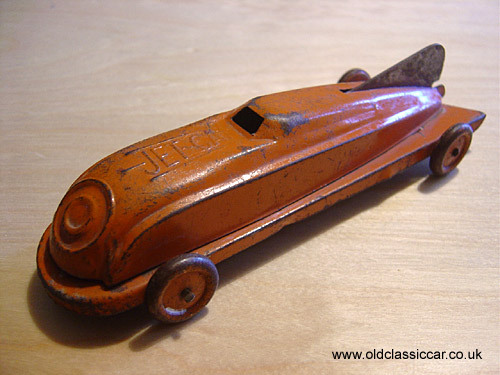 This classic tin toy, which is probably 1930s or 1940s in date, was built by JHR of England, according to the tiny writing on the pressed tin baseplate. Colour: orange body, unpainted baseplate.